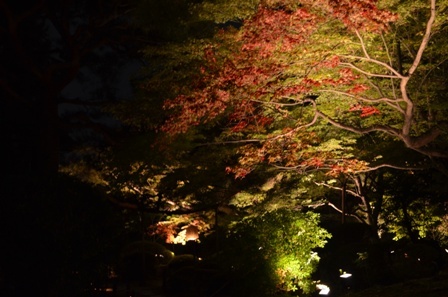 During the height of the autumn season, Kyoto opens up some of its temples and gardens to night illuminations. They also happen in the spring, but I didn’t know about them when I was there the last time. 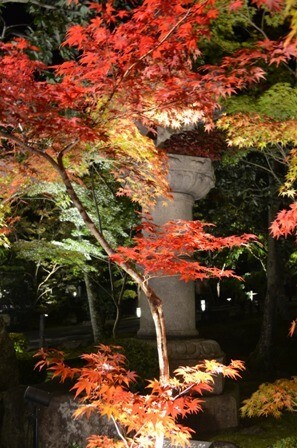 But this time, I did my research before my trip to maximize my autumn foliage viewing, and learned about all the different temples open at night. Sadly for me, some of the largest temple complexes didn’t open until after I left Kyoto. But there were more than one temple I was able to enjoy. 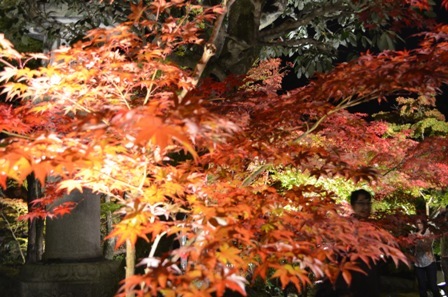 My first night in Kyoto I visited two temples: the Shorenin Temple and the Kodaiji Temple. 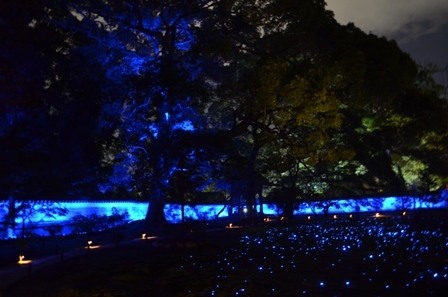 They are located in eastern Kyoto and roughly a 10/15 minute walk from each other. It’s always interesting to visit Japanese temples, because you are required to take your shoes off. But thankfully all the temples provide you with a convenient plastic bag to carry your shoes with you. 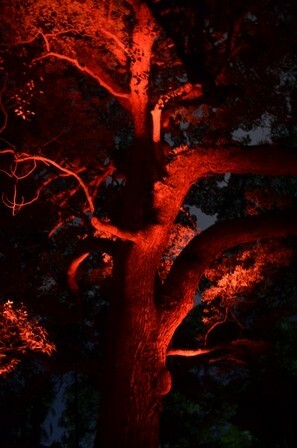 These temples also have illuminated gardens of trees. Kyoto hadn’t reached peak foliage during my visit, so there was still plenty of green leaves on the trees, but you could see oranges and reds as well. 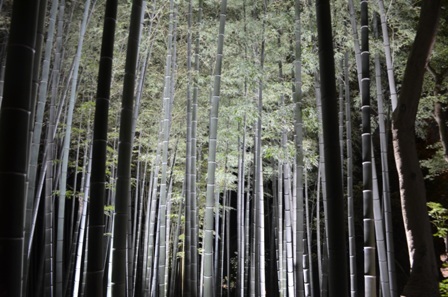 Shorenin Temple also has an illuminated bamboo forest. 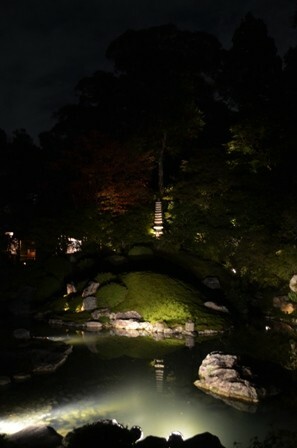 I visited Kodaiji Temple during my last trip and it was interesting to have a new perspective on it, with it being at night and in the autumn. 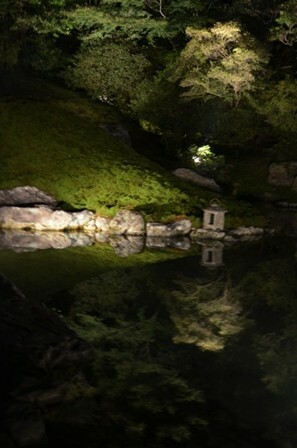 I was quite entranced with the images of reflections of the trees on still ponds. 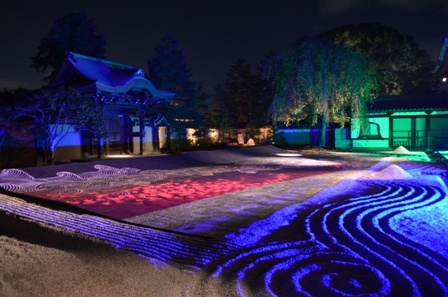 My favorite part of Kodaiji Temple was the illuminated sand garden. 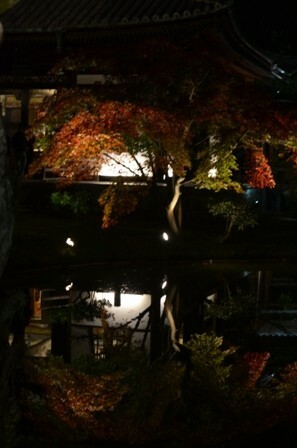 The second night I went to Eikando Temple. 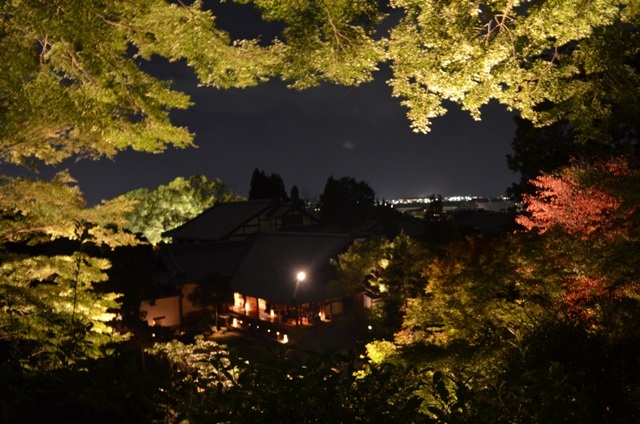 The temple is also located in eastern Kyoto and it’s about a 10 minute walk from Nanzenji Temple, so you can easily fit both temples into the same visit. 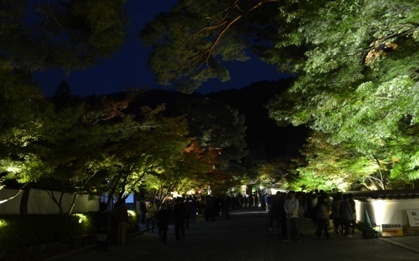 I wasn’t able to visit Nanzenji at night, because the temple gardens weren’t open for night business until later in November. 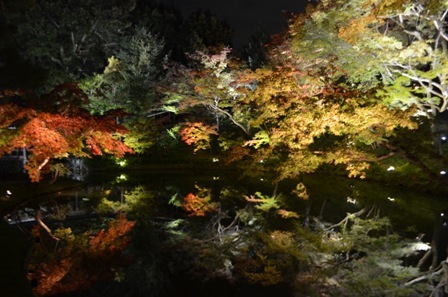 That is another reason why to schedule any Kyoto autumn visits for late November. This is the entrance way to the temple. I went there right when it opened at 1730. I went early figuring I would catch the temple, and then go enjoy dinner. It turns out that I wasn’t the only one who had that thought. There was a 20 minute wait to get into the temple. The line ran smoothly, though it meant there were hordes of people on site enjoying the illuminations. When I left the temple, there was no line or anything. So if you go to temple night visits, go later in the evening. Most of the temple night illuminations stay open between 2030-2130, so there is plenty of time each night to visit the temples. 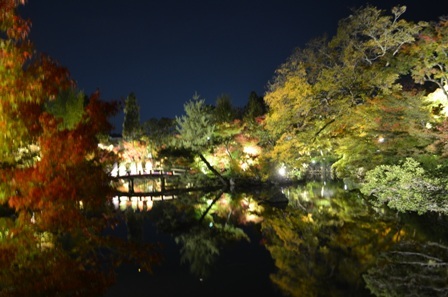 That is another thing about a Kyoto autumn visit. You won’t be the only one with the same brilliant idea, so just be prepared to enjoy your visit along with thousands of others. But you get good at elbowing people out of the way so you can take your picture. 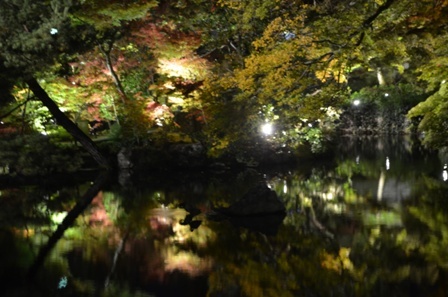 Eikando is particularly good for enjoying night reflections of different colored trees on bodies of water. 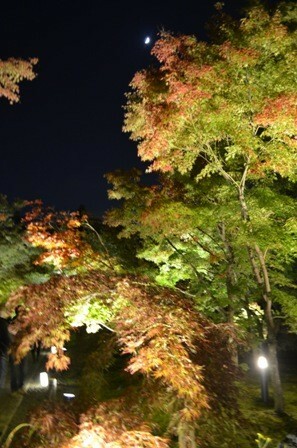 Like every other temple in Kyoto, it hadn’t hit peak foliage. But there were definitely brilliant patches of red leaves. 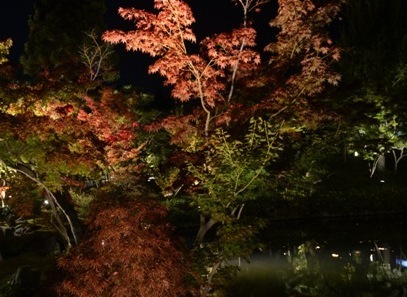 Eikando is supposed to be especially beautiful during autumn peak foliage, during both day and night. Definitely don’t miss it. 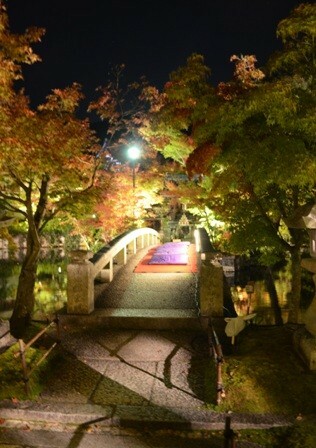 This entry was posted in Travel and tagged autumn foliage, Eikando Temple, Japan, Kodaiji Temple, Kyoto, night illuminations, Shorenin Temple.